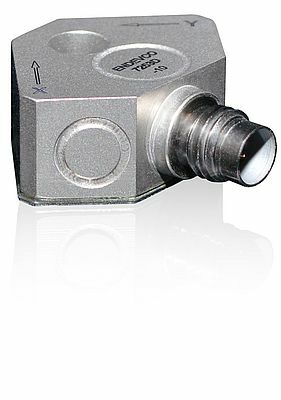 Meggitt Sensing Systems launches the Endevco model 7253D triaxial Isotron accelerometer designed for applications requiring the measurement of shock and vibration simultaneously in three mutually perpendicular axes. Primary applications include the testing of aircraft engines, industrial engines, aircraft/engine components, spacecraft components, flight testing and industrial machinery. Available in sensitivities of 10 mV/g or 100 mV/g, the Endevco model 7253D is small and lightweight with a broad frequency response. Features include thru-hole mounting for 360? cable orientation, hermetically sealed titanium housing to protect against environmental contamination, and signal ground isolated from the mounting surface by a hard anodized insulator. Dimensions are low-profile at 0.70" x 0.70" x 0.375", with a weight of <10 grams and operating temperature range of -67°F to +257°F (-55°C to +125°C).